When evaluating the official electoral ballots, suspicious looking documents could be uploaded on C1 Yanganeh and be reviewed by the crowd. Any incorrect figures and typing errors came to light immediately. The results of the C1 ballot were counted by the users on the Kawal Suara portal (“Voting Guardians” in English). They were really playing it safe: each IP address was allowed to scrutinise only the data from one voting booth. Over 31,000 ballots were verified in this manner helping to avoid any manipulation during the counting of votes. The politicians tried to obtain more votes by various means. They were even giving out free headscarves among other things. This and other similar bribes were made public on the Mata Massa platform. This allowed the users to share information by email, SMS or Smartphone apps. 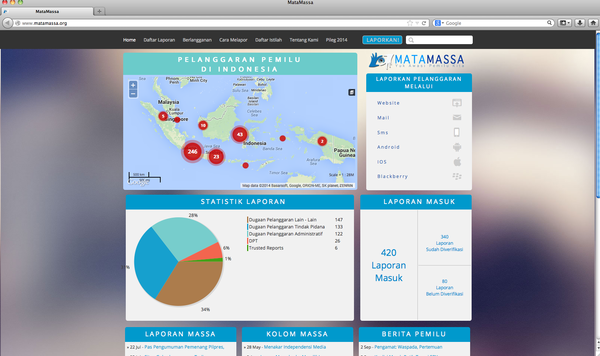 Not only the Indonesians were using Crowdsourcing to ensure a legitimate electoral process. Various online tools also helped to uncover fraud during the parliamentary elections of 2013 in Bulgaria. After vehement protests against President Bojko Borissow and his austerity measures, he resigned and a new parliament was chosen. To ensure that everything is all clear, the users on the platform Аз Гласувам (“I vote”) could post questions about the upcoming elections. Moreover, they could also report any irregularities and infringements before and during the elections. Trying to buy votes, for instance, would be one of these violations. The citizens reported these and other offenses on the Votebuying platform. Furthermore, the popular on-line-service Twitter played a huge role in Bulgaria: users were tweeting under different hash tags such as #izbori (“elections”) about the elections and reporting various problems. These tweets, posts and other contributions were collected on the crowd mapping platform За честни избори(“For Fair Elections”). It is true that these are only small steps, but they do demonstrate that the Crowd together can make a considerable progress on the path to more democracy in their country. This is a way to make sure votes are real and elections are valid.